Beverly Gamble, a knee surgery patient at Manhattan Orthopedic Care, joined the army of our happy and satisfied friends after her first knee surgery. The second surgery only made us closer friends. Friendly, interested and caring. 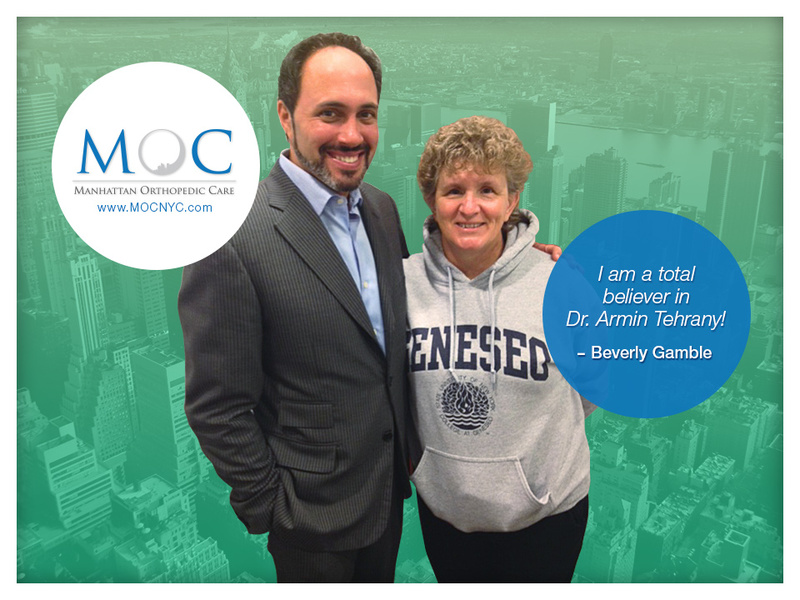 These are the three words that Beverly Gamble used in her Yelp review for a knee surgery to describe her experience with Manhattan Orthopedic Care board-certified physician Dr. Armin Tehrany. Mrs. Gamble was introduced to Dr. Tehrany, by recommendations from other happy knee surgery and shoulder surgery patients, who told her that Dr. Tehrany is the only orthopedist who can help her regain her life back after two knee surgeries. It’s was not only Dr. Armin Tehrany, MOC’s knee specialist, who showed the greatest of professional care to Mrs. Gable, but the whole MOC’s staff followed up, trying to make her stay as comfortable as possible. From the surgeries done on time to the equipment delivered to her when needed, everything was done to make Mrs. Gamble be happy and start with her recovery and get stronger. As Mrs. Gamlbe said, „it’s a well-oiled machine”. This patient was treated at the Staten Island Office.